Delivered to U.S. Army Air Force as 44-74602, 1945. - Allocated to various training units. Delivered to Royal Canadian Air Force as 9255. - BOC: December 6, 1950. - Allocated to 424th Squadron, Ontario. Aero Enterprises, Elkhart, IN, August 19, 1961. Robert E. King, South Bend, IN, November 1961-1963. Aero Enterprises, Elkhart, IN, March 27, 1963. C.E. Crosby, Bellingham, WA, May 20, 1963-1967. - Flew as race #3/"Mr. Choppers". Jack C. Hovey/Hovey Machine Products, Walnut Creek/Oakland/Ione, CA, July 10, 1967-2002. 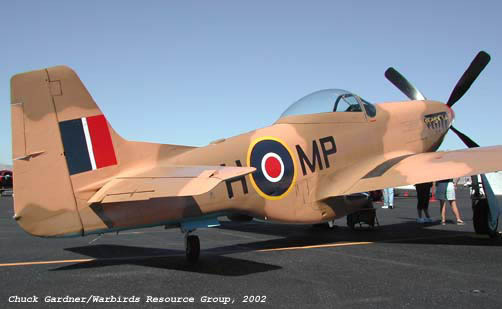 - Flown in RAF camo scheme/HM-P as race #2.